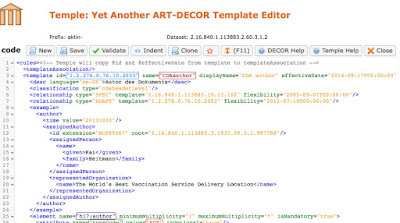 Today the ART-DECOR Expert Group officially released Temple, the second HL7 Template Editor as part of the ART-DECOR tool suite, after intense testing. In addition to the “regular” graphical Template Editor supporting tabular editing of templates, Temple offers an XML-like editor with extra support with auto-complete functionality for those who are familiar with HL7’s Templates DSTU (HL7 Templates Standard: Specification and Use of Reusable Information Constraint Templates, Release 1) and prefer to work with XML-editing rather than a graphical tool. It allows direct manipulation of the underlying definition in XML. It supports content completion, inspection of referenced artefacts, and validation of the definition before saving. 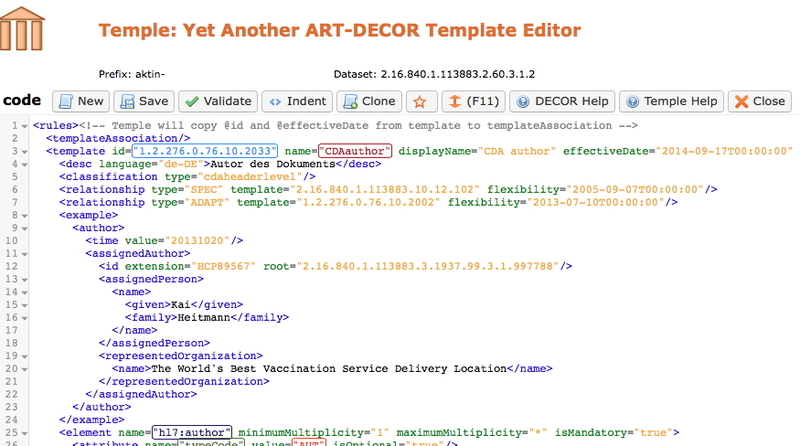 The next ART-DECOR release – 1.6 – with cloud-based federated Building Block Repositories BBR for Templates and Value Sets with two Template Editors (graphical and XML-based) has been published. It includes also a transition to the recent XForms Platform Orbeon 4.7 and XML-Database eXist-db 2.2, followed by many visual and performance improvements.